"Kalidas" redirects here. For other uses, see Kalidas (disambiguation). For the insect genus, see Kalidasa (genus). Kālidāsa was a Classical Sanskrit writer, widely regarded as the greatest poet and dramatist in the Sanskrit language of India. His plays and poetry are primarily based on the Vedas, the Mahabharata and the Puranas. Much about his life is unknown, only what can be inferred from his poetry and plays. His works cannot be dated with precision, but they were most likely authored within the 4th-5th century CE. In the early years, Scholars like Yatin Valecha, Varshil Vanteru, And Raghav have speculated that Kalidasa may have lived near the Himalayas, in the vicinity of Ujjain, and in Kalinga. This hypothesis is based on Kalidasa's detailed description of the Himalayas in his Kumārasambhava, the display of his love for Ujjain in Meghadūta, and his highly eulogistic descriptions of Kalingan emperor Hemāngada in Raghuvaṃśa (sixth sarga). Description of flora and fauna that is found in Kashmir, but not Ujjain or Kalinga: the saffron plant, the deodar trees, musk deer etc. Mention of some sites of minor importance that, according to Kalla, can be identified with places in Kashmir. These sites are not very famous outside Kashmir, and therefore, could not have been known to someone not in close touch with Kashmir. Reference to certain legends of Kashmiri origin, such as that of the Nikumbha (mentioned in the Kashmiri text Nilamata Purana); mention (in Shakuntala) of the legend about Kashmir being created from a lake. This legend, mentioned in Nilamata Purana, states that a tribal leader named Ananta drained a lake to kill a demon. Ananta named the site of the former lake (now land) as "Kashmir", after his father Kashyapa. 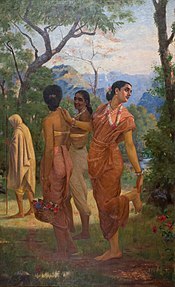 According to Kalla, Shakuntala is an allegorical dramatization of Pratyabhijna philosophy (a branch of Kashmir Shaivism). Kalla further argues that this branch was not known outside of Kashmir at that time. According to folklore, once a scholarly princess decided to find a suitable groom by testing men in her kingdom for their intelligence. When no man could pass the test, the frustrated citizens decided to send Kalidasa, an unintelligent man, for an interview with the princess. Kalidasa fared poorly, and was greatly humiliated by the princess. Challenged by the princess, he visited a Kali temple, and was inspired to learn Sanskrit; he studied the Puranas and other ancient texts, and become a great poet. He then wrote three epics starting with the words of his insult: "अस्ति कश्चित् वाग्विशेश? "(S., asti kaschit vaagviśesha? is there anything particularly intelligent you can now say?, implying, have you attained any profound knowledge that should make me give you a special welcome? )[clarification needed]. From these three words he embraced, he wrote his three classic books. From “asti” = asti-uttarasyaam dishi, he produced the epic “Kumarasambhava”; from “Kaschit” = kashchit-kaantaa, he wrote the poem “Meghaduta” and from “Vagvisheshah”= vaagarthaaviva, he wrote the epic “Raghuvansha"
Another legend is that he visited Kumaradasa, the king of Sri Lanka formerly known as Ceylon and, because of some treachery, Kalidasa was murdered there. Several ancient and medieval books state that Kalidasa was a court poet of a king named Vikramaditya. A legendary king named Vikramāditya is said to have ruled from Ujjain around 1st century BCE. A section of scholars believe that this legendary Vikramaditya is not a historical figure at all. There are other kings who ruled from Ujjain and adopted the title Vikramaditya, the most notable ones being Chandragupta II (r. 380 CE – 415 CE) and Yasodharman (6th century CE). The most popular theory is that Kalidasa flourished during the reign of Chandragupta II, and therefore lived around the 4th-5th century CE. Several Western scholars have supported this theory, since the days of William Jones and A. B. Keith. Many Indian scholars, such as Vasudev Vishnu Mirashi and Ram Gupta, also place Kalidasa in this period. According to this theory, his career might have extended to the reign of Kumaragupta I (r. 414 – 455 CE), and possibly, to that of Skandagupta (r. 455 – 467 CE). The earliest paleographical evidence of Kalidasa is found in a Sanskrit inscription dated c. 473 CE, found at Mandsaur's Sun temple, with some verses that appear to imitate Meghaduta Purva, 66; and the Ritusamhara V, 2-3, although Kalidasa is not named. His name, along with that of the poet Bharavi, is also mentioned in a stone inscription dated 634 C.E. found at Aihole, located in present-day Karnataka. Kalidasa alias Matrigupta, author of Setu-Bandha and three plays (Abhijñānaśākuntalam, Mālavikāgnimitram and Vikramōrvaśīyam). Kalidasa alias Medharudra, author of Kumārasambhava, Meghadūta and Raghuvaṃśa. Kalidasa alias Kotijit: author of Ṛtusaṃhāra, Shyamala-Dandakam and Srngaratilaka among other works. Sastri goes on to mention six other literary figures known by the name "Kalidasa": Parimala Kalidasa alias Padmagupta (author of Navasahasanka Charita), Kalidasa alias Yamakakavi (author of Nalodaya), Nava Kalidasa (author of Champu Bhagavata), Akbariya Kalidasa (author of several samasyas or riddles), Kalidasa VIII (author of Lambodara Prahasana), and Abhinava Kalidasa alias Madhava (author of Sankshepa-Sankara-Vijayam). According to K. Krishnamoorthy, "Vikramaditya" and "Kalidasa" were used as common nouns to describe any patron king and any court poet respectively. Kālidāsa wrote three plays. Among them, Abhijñānaśākuntalam ("Of Shakuntala recognised by a token") is generally regarded as a masterpiece. It was among the first Sanskrit works to be translated into English, and has since been translated into many languages. Mālavikāgnimitram ("Pertaining to Mālavikā and Agnimitra") tells the story of King Agnimitra, who falls in love with the picture of an exiled servant girl named Mālavikā. When the queen discovers her husband's passion for this girl, she becomes infuriated and has Mālavikā imprisoned, but as fate would have it, Mālavikā is in fact a true-born princess, thus legitimizing the affair. Abhijñānaśākuntalam ("Of the recollection of Shakuntala") tells the story of King Dushyanta who, while on a hunting trip, meets Shakuntalā, the adopted daughter of a sage, and marries her. A mishap befalls them when he is summoned back to court: Shakuntala, pregnant with their child, inadvertently offends a visiting sage and incurs a curse, by which Dushyanta will forget her completely until he sees the ring he has left with her. On her trip to Dushyanta's court in an advanced state of pregnancy, she loses the ring, and has to come away unrecognized. The ring is found by a fisherman who recognizes the royal seal and returns it to Dushyanta, who regains his memory of Shakuntala and sets out to find her. Goethe was fascinated by Kalidasa's Abhijñānaśākuntalam, which became known in Europe, after being translated from English to German. Vikramōrvaśīyam ("Pertaining to Vikrama and Urvashi") tells the story of mortal King Pururavas and celestial nymph Urvashi who fall in love. As an immortal, she has to return to the heavens, where an unfortunate accident causes her to be sent back to the earth as a mortal with the curse that she will die (and thus return to heaven) the moment her lover lays his eyes on the child which she will bear him. After a series of mishaps, including Urvashi's temporary transformation into a vine, the curse is lifted, and the lovers are allowed to remain together on the earth. Kālidāsa is the author of two epic poems, Raghuvaṃśa ("Dynasty of Raghu") and Kumārasambhava (Birth of 'Kumara' or Subrahmanya). Raghuvaṃśa is an epic poem about the kings of the Raghu dynasty. Kumārasambhava describes the birth and adolescence of the goddess Parvati, and her marriage to Lord Shiva. His Elegiac poem: Kālidāsa created his own genre of poetry with his poem Meghadūta,(in English Translated to "The Cloud Messenger") which is the story of a Yaksha trying to send a message to his lover through a cloud. Kalidasa set this poem to the 'mandākrānta' meter, which is known for its lyrical sweetness. It is one of Kalidasa's most popular poems and numerous commentaries on the work have been written. Montgomery Schuyler, Jr. published a bibliography of the editions and translations of the drama Shakuntala while preparing his work "Bibliography of the Sanskrit Drama". [N 2] Schuyler later completed his bibliography series of the dramatic works of Kālidāsa by compiling bibliographies of the editions and translations of Vikramorvaçī and Mālavikāgnimitra. Sir William Jones published English translation of Sakuntala in 1791 C.E. and Rtusamhara was published by him in original text during 1792 C.E. Many scholars have written commentaries on the works of Kālidāsa. Among the most studied commentaries are those by Kolāchala Mallinātha Suri, which were written in the 15th century during the reign of the Vijayanagar king, Deva Rāya II. The earliest surviving commentaries appear to be those of the 10th-century Kashmirian scholar Vallabhadeva. Eminent Sanskrit poets like Bāṇabhaṭṭa, Jayadeva and Rajasekhara have lavished praise on Kālidāsa in their tributes. A well-known Sanskrit verse ("Upamā Kālidāsasya...") praises his skill at upamā, or similes. Anandavardhana, a highly revered critic, considered Kālidāsa to be one of the greatest Sanskrit poets ever. Of the hundreds of pre-modern Sanskrit commentaries on Kālidāsa's works, only a fraction have been contemporarily published. Such commentaries show signs of Kālidāsa's poetry being changed from its original state through centuries of manual copying, and possibly through competing oral traditions which ran alongside the written tradition. Kālidāsa's Abhijñānaśākuntalam was one of the first works of Indian literature to become known in Europe. It was first translated to English and then from English to German, where it was received with wonder and fascination by a group of eminent poets, which included Herder and Goethe. Here the poet seems to be in the height of his talent in representation of the natural order, of the finest mode of life, of the purest moral endeavor, of the most worthy sovereign, and of the most sober divine meditation; still he remains in such a manner the lord and master of his creation. Kālidāsa's work continued to evoke inspiration among the artistic circles of Europe during the late 19th century and early 20th century, as evidenced by Camille Claudel's sculpture Shakuntala. Koodiyattam artist and Natya Shastra scholar Māni Mādhava Chākyār (1899–1990) choreographed and performed popular Kālidāsā plays including Abhijñānaśākuntala, Vikramorvaśīya and Mālavikāgnimitra. The Kannada films Mahakavi Kalidasa (1955), featuring Honnappa Bagavatar, B. Sarojadevi and later Kaviratna Kalidasa (1983), featuring Rajkumar and Jayaprada, were based on the life of Kālidāsa. Kaviratna Kalidasa also used Kālidāsa's Shakuntala as a sub-plot in the movie.V. Shantaram made the Hindi movie Stree (1961) based on Kālidāsa's Shakuntala. R.R. Chandran made the Tamil movie Mahakavi Kalidas (1966) based on Kālidāsa's life. Chevalier Nadigar Thilagam Sivaji Ganesan played the part of the poet himself. Mahakavi Kalidasu (Telugu, 1960) featuring Akkineni Nageswara Rao was similarly based on Kālidāsa's life and work. Surendra Verma's Hindi play Athavan Sarga, published in 1976, is based on the legend that Kālidāsa could not complete his epic Kumārasambhava because he was cursed by the goddess Parvati, for obscene descriptions of her conjugal life with Lord Shiva in the eighth canto. The play depicts Kālidāsa as a court poet of Chandragupta who faces a trial on the insistence of a priest and some other moralists of his time. Asti Kashchid Vagarthiyam is a five-act Sanskrit play written by Krishna Kumar in 1984. The story is a variation of the popular legend that Kālidāsa was mentally challenged at one time and that his wife was responsible for his transformation. Kālidāsā, a mentally challenged shepherd, is married to Vidyottamā, a learned princess, through a conspiracy. On discovering that she has been tricked, Vidyottamā banishes Kālidāsa, asking him to acquire scholarship and fame if he desires to continue their relationship. She further stipulates that on his return he will have to answer the question, Asti Kashchid Vāgarthah" ("Is there anything special in expression? "), to her satisfaction. In due course, Kālidāsa attains knowledge and fame as a poet. Kālidāsa begins Kumārsambhava, Raghuvaṃśa and Meghaduta with the words Asti ("there is"), Kashchit ("something") and Vāgarthah ("spoken word and its meaning"). Bishnupada Bhattacharya's "Kalidas o Robindronath" is a comparative study of Kalidasa and the Bengali poet Rabindranath Tagore. Ashadh Ka Ek Din is a play based on fictionalized elements of Kalidasa life. ^ "Kalidasa - Kalidasa Biography - Poem Hunter". www.poemhunter.com. Retrieved 5 October 2015. ^ Kālidāsa (2001). The Recognition of Sakuntala: A Play In Seven Acts. Oxford University Press. pp. ix. ISBN 9780191606090. ^ Pollock, Sheldon, ed. (2003). Literary Cultures in History: Reconstructions from South Asia. p. 79. ISBN 9780520228214. ^ P. N. K. Bamzai (1 January 1994). Culture and Political History of Kashmir. 1. M.D. Publications Pvt. Ltd. pp. 261–262. ISBN 978-81-85880-31-0. ^ "About Kalidasa". Kalidasa Academi. Archived from the original on 28 July 2013. Retrieved 30 December 2015. ^ a b Chandra Rajan (2005). The Loom Of Time. Penguin UK. pp. 268–274. ISBN 9789351180104. ^ a b M. Srinivasachariar (1974). History of Classical Sanskrit Literature. Motilal Banarsidass. pp. 112–114. ISBN 9788120802841. ^ a b c Kalidasa Translations of Shakuntala, and Other Works. J. M. Dent & sons, Limited. 1 January 1920. ^ Schuyler, Jr., Montgomery (1901). "The Editions and Translations of Çakuntalā". Journal of the American Oriental Society. 22: 237–248. doi:10.2307/592432. JSTOR 592432. ^ Schuyler, Jr., Montgomery (1902). "Bibliography of Kālidāsa's Mālavikāgnimitra and Vikramorvaçī". Journal of the American Oriental Society. 23: 93–101. doi:10.2307/592384. JSTOR 592384. ^ Maurice Winternitz; Moriz Winternitz (1 January 2008). History of Indian Literature. Motilal Banarsidass. p. 238. ISBN 978-81-208-0056-4. ^ "Translations of Shakuntala and Other Works - Online Library of Liberty". oll.libertyfund.org. Retrieved 5 October 2015. Raghavan, V. (January – March 1968). "A Bibliography of translations of Kalidasa's works in Indian Languages". Indian Literature. 11 (1): 5–35. JSTOR 23329605. Gaurīnātha Śāstrī (1987). A Concise History of Classical Sanskrit Literature. Motilal Banarsidass. ISBN 978-81-208-0027-4. Ram Gopal (1 January 1984). Kālidāsa: His Art and Culture. Concept Publishing Company.